I’ve heard it said (many times) that there are many English Literature professors who are bemoaning the lack of biblical literacy in our society, because it’s difficult to understand English Literature if we do not understand the Bible. As the argument goes, the dominant themes and issues that our culture reflects on come from scripture, which has shaped our culture and the literature we produce. Today’s English majors don’t get the biblical allusions and theological themes that pervade our culture’s great works of literature – but it goes beyond that: scripture is everywhere. I’m excited to be taking a course next semester called Religious Themes in Literature, but in the meantime I’ve been thoroughly enjoying finding religious themes in comic books, video games, television, and film. This morning at church our school’s theatre troupe, Prov Players, performed a play that dealt with the topic of suicide and the value of life. It made me think about Ant Man, and Ultron 5, and Noah. Allow me a brief synopsis of a story line that unfolded over years of comic books. Dr. Henry Pym is a brilliant scientist who develops technology that allows him to shrink to the size of an ant (presumably smaller, if he so chose) or to tremendously large sizes (he later sometimes goes by Giant Man). His original self-experiment shrunk him to ant-size, which was quite dangerous for him; he thus developed technology to allow him to communicate with ants – hence the name, Ant Man. Anyways, enough back story. Of all of the Avengers, Ant Man is the most reluctant crime-fighter. He’s a pacifist, and fights for the sake of defending the world. He hates it. He would much rather help the world through creating new advances in science and technology, rather than locking up super villains one at a time. One of the things that he did to help the world is to create a tiny prison for super villains, all shrunk using his technology. The guards of this prison were robots called Ultron, created in a joint effort between Dr. Pym and Tony Stark (AKA Iron Man). Ultron was Dr. Pym’s masterpiece, with artificial intelligence based on a map of the human brain – Dr. Pym’s brain, to be exact. Ultron inherited some of Pym’s ideas, as well: a drive to create a peaceful world, for example. But during an incredible threat to the planet, Ultron became acquainted with violence. From that point on Ultron was no longer a pacifist, but still shared Pym’s desire to create a peaceful world. From that point on, Ultron became convinced that it was only violent life that stood in the way of peaceful existence. Considering that even his own creator and supposed pacifist, Ant Man, was frequently very violent, Ultron became convinced that the only way to have a peaceful world was to have a world without life – so he set about to destroy all life on earth. If you’re a sci-fi fan, you’ve heard this story before (for example, the defense computer system, SKYNET, tried the same thing in the Terminator franchise; it also shows up in I, Robot). Being a synthetic being who was never technically alive, Ultron didn’t realize that there was inherent value in life itself. He failed to grasp the fact that a peaceful world is pointless without living creatures to enjoy it. After an epic battle that seemed to be impossible to win, Ant Man gave Ultron an update in his logic: for a truly peaceful world, Ultron could not exist either (at least, according to the 2010 Avengers cartoon series, which condenses decades of comic storylines into a single season). We of the Abrahamic faiths share a similar story. God desired to create a perfect world, and created humans in his image in order to help him achieve this goal. In this story, like the story of Ultron, it is the created ones who turn on their creators; however, in this story the creator is perfect, while the created ones are flawed (while in the Avengers, Ultron is trying to accomplish what Ant Man was too flawed to accomplish). Human beings rebelled against God, gradually becoming more and more evil, to the point where God’s intended perfect, peaceful world seems impossible to achieve so long as there are people left alive on it. So God, like Ultron, thinks that perhaps it would be better if human beings did not exist, and plans a flood to wipe out life on earth. Many environmentalists today muse about this as well; it seems that we’re the only species that doesn’t fit into the ecosystem. The Matrix dealt with this thought too, as Agent Smith (a computer program) calls human beings a “virus” because we go from place to place, staying only long enough to deplete the resources and destroy the environment before we move on, all for the purpose of our own self-replication. 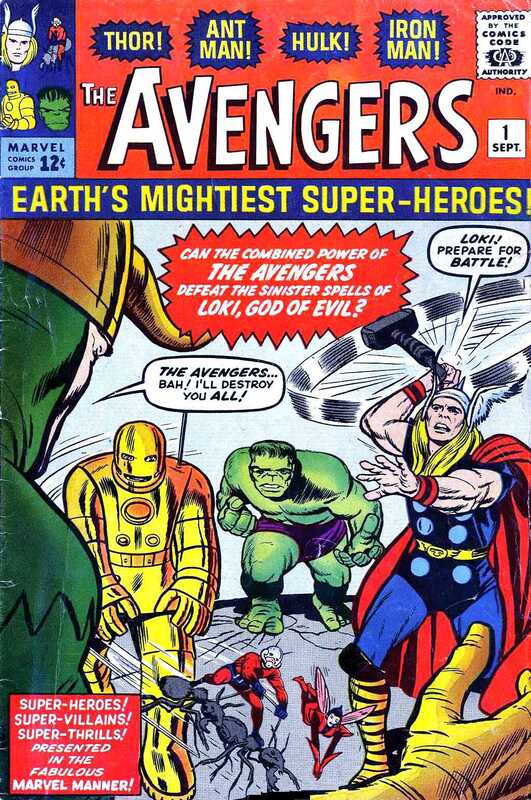 Unlike Ultron, God is very reluctant to destroy all life on earth. He sees the inherent value of life, and acts to preserve it. He gets the last righteous man on earth to build a giant boat, in which he can keep two of every type of animal safe from the flood he’s about to use to destroy the planet. With these animals, and with Noah and his family, earth will get a second chance. Ultron offers no second chances: he knows that human beings will always have it in them to be violent. God knows that too: even after the flood, Genesis tells us that God knew that the desires of humans’ hearts were evil – and yet he gave life another chance anyway. God goes further, and says that he will never again destroy humanity, even though he knows we’ll be evil again. Because life is inherently valuable, even when it is evil, destroying life is not a solution to the problem of evil. Instead, God sets about destroying the evil that is inside the person. As you may have noticed, this is a long process! Different versions of this story show up over and over again throughout human history. In this story, the only difference between a good result (a second chance for the world) and an evil result (elimination of all life) is a sense of inherent value to life itself, no matter how large or small, good or evil, it may be. The ethical implications of this are numerous: killing, while it may seem to solve many problems, is not in itself a satisfying solution. This notion affects our understanding of suicide, assassination, abortion, capital punishment, euthanasia, etc. But going beyond concrete ethical problems, this contributes to our answer to the philosophical problem of evil: if God is good, and all powerful, why is the world evil? A big part of the answer is simply that life’s inherent value, when combined with sinful humanity, leaves God in a bit of a Catch-22. Life is an end in itself, and without it peace is meaningless – thus, human beings will go on killing one another until something within us changes, because even violent existence is better than none. In Heaven, Can We Fly? A short thought about heaven. I’ve long noticed that our cultural notion of heaven doesn’t align very closely with what scripture says about it. When I was a kid, I thought that heaven was a place in the sky, maybe on the clouds or maybe just beyond them, where everyone can do whatever they want. I thought that I would be as young or as old as I wanted, forever. I thought, surely, that in heaven I would be able to fly, and breathe underwater, and do whatever else I’m not able to do here on earth. After all, heaven is a place where everyone is happy, right? What could make us all happy other than getting what we want all the time? Sometimes I still think this way. I think sometimes we all do. A fun thought experiment about this is a comic series in the Marvel universe called “House of M.” A brief synopsis: The Scarlet Witch has lost her mind, and used her reality-altering powers to create a world in which all of her friends get what they’ve always wanted. Mutants are no longer feared or hunted by regular humans; her friends have their dream jobs; romantic relationships that were complicated in the real world are loving and functional. Spider-man’s uncle Ben is alive, as is his first love, Gwen Stacy, and rather than being considered an outlaw vigilante he is instead a celebrity who doesn’t have to hide his face. It seems as though everyone gets whatever they want. But what Wolverine has always wanted is to remember his own past. Now, suddenly, he not only has the memories he’s been searching for, but he’s also the only person in the world who seems to realize that there’s something wrong. That this reality really is too good to be true. We quickly discover that this world is far from perfect. Mutants are no longer a hunted minority; they seem to be a majority, and have all of the power and respect that the worst of them had once craved. The premiere family in this world is the House of Magnus – that is, Magneto, the Scarlet Witch’s father. Non-mutants with powers (like Spider-man, Iron Man, the Hulk, etc.) are respected, but non-powered, regular people form an underclass that is highly discriminated against. Homo Sapiens (as opposed to “Homo Superior”) are called “Sapes”, and treated worse than apes. There is a complete reversal in the balance of power, and while it seems that most of the main characters have completely perfect lives, this world is far from perfect. Heaven as a place where everyone gets what they want is far from the biblical picture of heaven, but more than that, it’s an impossibility. Even if God were to bend reality to meet all of our desires, our desires inevitably conflict: as soon as I want what someone else has, we run into problems. But worse than being impossible, this notion of heaven is harmful to us. It feeds our individual desires, perhaps even giving us a sense of entitlement: “when I get to heaven, I’ll get whatever I want.” Imagine a person who’s been told that all of their life, arriving in heaven. What a child they would be! Even aside from the fact that what we want is rarely good for us, Christ teaches us that it is in what we give away that we find our significance and purpose. It is in what we are willing to give up that we can find true happiness. Put another way, promoting one right demands relinquishing another. My right to worship God in total freedom also requires that I allow others to do likewise; if I tried to control the religions of others, I would be violating the same right that I held dear. The right to freedom precludes the right to control; the right to live precludes the right to kill. The only way that I could get absolutely everything that I wanted in heaven would be if I were there by myself. Ultimately, this view of heaven is the ultimate in self-absorption and hedonism. It’s hard to find God in that. Scripture paints a very different view of heaven. It’s a place where God rules, where justice is guaranteed, where nobody is poor, and where everyone is in right relationship with their neighbour and with God. There’s nothing in there about never having to work, or about having superpowers, or anything else like that. It’s always earth, but it’s earth the way it was always supposed to be – back to the Garden of Eden, in a sense. It’s an ultimate second chance for us all. What’s truly amazing about this view of heaven is that, to some extent, it’s possible. God has already healed the relationship between human beings and Himself, by becoming a human being in Jesus Christ. Sustainable living and poverty alleviation are possible in theory; human sin just gets in the way. Revelation says that sin and death are the final enemies, and that they will be destroyed some day; in this we find the difference between this earth and the new earth (usually referred to as heaven). The only difference between this world and heaven is the presence of sin in us. Flying, it turns out, is a moot point. Loving, after all, is much better.